I have become aware of a social dysfunction that we are all guilty of doing. We are on our smartphones all the time. The worst is when we are at a restaurant with others, virtually ignoring them as if we are in a bubble. I know we are all addicted to our smartphones these days. I plead guilty as charged. God forbid we left our smartphones at home, we would break out in hives. The need for constant information and to be connected to the world is our new world. However, there are real consequences to this new reality in the way we behave and interact with others. So, I am going to propose to make a social statement with an experiment which will be, to say the least, very unorthodox. 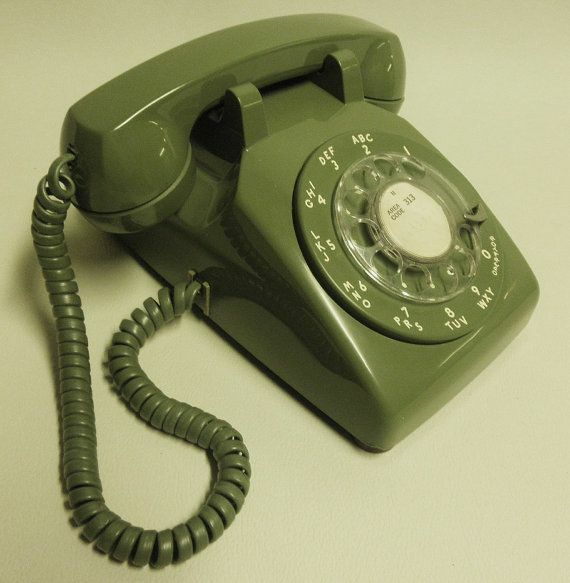 I ordered a 1972 avocado rotary telephone from Ebay. What is great about Ebay is that you can buy almost any obscure item, even used toe nail clippings. I refrained from that auction, though. So you may inquiry what I am going to do with an inoperable, antiquated, used rotary telephone? I thought you would never ask! I am going to take it to restaurants and leave my iPhone 6 in the car. As I walk into various restaurants in the next several weeks, I will ask to be seated while carrying a four pound rotary phone. Likewise, I also expect to be seated next to the kitchen door that slams into my chair as the waitstaff walks in and out. If that is the price I need to pay, so be it. Before the server presents me the menu, I will have the avocado phone placed to the left of the bread and butter plate, so they may have slight difficulty placing the bread basket due to the lack of real estate on the table. As the server greets me, I will be on the phone with no person on the other line (except the imaginary Ed Asner in his editors office on the Mary Tyler Moore Show) and will then hang up to be polite. I hope this server is mentally stable or else I am in for a strand of hair in in my Garden Salad for starters. During the meal, I intend to make random fictitious phone calls. I have already decided that I will be dialing 1-888-899-9898. That will take a significant amount of time and will serve two purposes. The first is that it will give me the maximum amount of dialing time for people to notice. Secondly, it will be therapeutic for me since this experiment is also to help me wean off my iPhone. Think of it like a nicotine patch. The feel of putting my index finger through those small holes can be pacifying; sort of like a knuckle workout. I need to slowly get use to not knowing the latest Facebook update or the Mets score in mid April for an hour and a half. As other diners take note, one can imagine what must be going through their minds, thats if they are not on their smartphones and can multi-task two thoughts at the same time. I can see it now; I will get an unmistakable stare that I am a person with either severe mental illness or someone who has an odd fetish for 1970’s nostalgia in public places. I think they will surmise it is the former. Either way, those people might actually get off their phones and speak to the “stranger” sitting across from them and engage in (get ready for this) a one-on-one conversation! The social experiment has now entered is embryonic stage. What I hope to achieve, besides pure embarrassment, is that there will be a few people that will actually come over to me and ask, “What in God’s name am I doing” or, “Do you need medical attention?” Mission accomplished! At that moment, I will attempt to explain my apparent bizarre behavior in trying to make a greater point. No, the greater point is not to look like the laughing stock in the restaurant. It is to engage them that we are really losing our social humanity and etiquette, wanting to bring this point home with an action that might peak their interest. Hopefully they can look at themselves through my potential humiliation to instill some sense of projection. It is really damaging to see 75% of restaurant patrons on their phones while eating out. Do we no longer have and a couple of hours for ourselves with others anymore? Why go out with a person to a restaurant when we would rather be texting and conversing with anyone other than the person who we chose to dine in the first place? What the hell is wrong with us? Now I understand that keeping a phone in a purse of pocket for an emergency is indeed acceptable. However, we have entered a new paradigm whereby the world revolves around our own immediate interests at the exclusion of personal engagement. It’s as if we are afraid to talk and share our feelings because our phones can give us the escape from real conversations. I hope this social experiment will make a small statement for the better good of us all. If you think this is too extreme, let me know. If you think that this might work, even in a small way, please leave feedback so I can get the encouragement to take this on. I agree that my actions won’t change this new culture. However, I think it is important for everyone to do their part in trying to bring back a sense of togetherness and respect that this society has seemed to have lost. Sometimes technology outpaces the human capacity to adjust. I think this is a good example. Scott, I love your idea/experiment! I so agree with your observations about people’s lack of ability to interact with other individuals. Love this idea! Keep us posted on how it goes. Even though it may not change the lack of civility in society, it is still a statement that must be made. Many today feel that proper etiquette is passe and those who attempt to practice polite standards are often ridiculed and looked down on as ‘intolerant,’ one of the most misused words in our language. Tolerance is putting up with what is wrong, not perfect or incorrect, as opposed to allowing any and every action. Perhaps the definition has been twisted today, but that just means the definition is incorrect, and should be applied to a new word or different phrase, and the original meaning of tolerance should be properly understood. Think of tolerance like a machinist does: A little helps things operate smoothly, but too much cause the machine to not operate or simply fall apart. Carry the phone and use the opportunities it provides to get people to think. Maybe some actually will. Very well written! You get it! We are not intolerant. We are socially grounded in respect for others; a trait that is sorely missing in current culture. It has become a “me-me” society and we need more of a focus to “we-we.” Then and only then will we engage one another in a meaningful and mutually respectful manner.